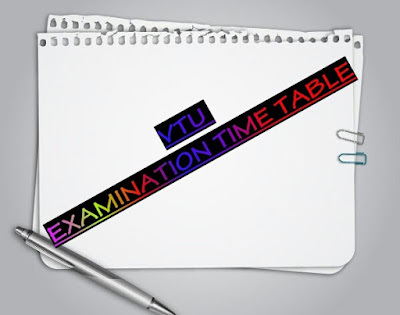 We have received the official draft copy of VTU exam time table 2017-18 from official VTU site and arranged it semester wise to make it easy to go through. Check your VTU examination dates and in the case of shuffled subjects, contact your college HOD’s or examination department, so that VTU shall make necessary changes. The draft timetables are in accordance with the academic calendar issued by the Registrar, VTU. The Timetables for B.Arch., M.Arch., M.Tech. (E&C Branch for 2010 & 2012 Scheme) will be announced later. The Principals of_all the affiliated engineering colleges are requested to arrange for the perusal/inspection of the timetables for any overlap of examinations, especially in the case of students who are shifted from any old scheme to the new scheme. The same may be brought to the notice of the undersigned for correction. Suggestions/comments are welcome, but positively on or before 10-11-2017. All the concerned people are therefore requested to go through the draft layout timetable and offer their suggestions and cooperate in the whole process of the examinations. Suggestions may be given through email at qpdsl@vtu.ac.in. CIRCULAR – Draft Layout time table of UG & PG for Examination December 2017 / January 2018.